If you’ve ever drawn arcs in Visio, then grouped them together with other shapes, you may have noticed that they behave rather oddly on resizing. As you make the group bigger or smaller, the arcs may bow or squish in ways that you didn’t expect. This problem arises because of the interaction style of the arc shapes, which is 1D. 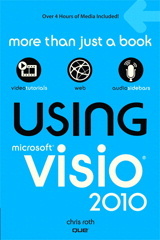 Visio has two interaction styles: 1D and 2D. They have to do with the green handles you see on the shape, and how you go about manipulating the shape with the mouse. In this article, we’ll describe the difference between the two interaction styles, and explain how to correct resizing problems you might be encountering.